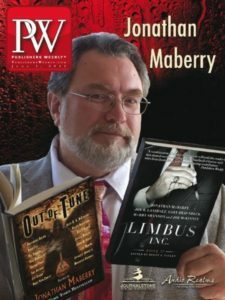 Reading the Jonathan Maberry books in order for his two main series is not only a treat for crime mystery book lovers, but also for zombie apocalypse fans. The first time I came across this author was through picking a copy of Patient Zero, the first in his Joe Ledger series. I have just finished reading Khost by Vincent Hobbes, and I was searching for a book written in the same veins in the techno-thriller/horror genre. Someone on Goodreads recommended I try the Jonathan Maberry Joe Ledger series, and the rest is history. I was hooked for good. So here are the Jonathan Maberry books in order, because trust me, he wrote so many books ranging to some many different series across genres, that it’s easy to get lost while trying to find your next favorite read. Jonathan Maberry was born in Kensington, Philadelphia in 1958. He went to the Frankford High School, after which for college he attended the Temple University. As his childhood was spent in a rather rough neighborhood, he took martial art classes to learn to defend himself. The next step in his career changed his topics drastically from martial arts to the esoteric the occult and the paranormal, having written books including The Vampire Slayers Field Guide to the Undead, Vampire Universe: The Dark World of Supernatural Beings That Haunt Us and Wanted Undead or Alive, among others. The author started writing on a professional level while in college, by selling magazine feature articles. Moving on to writing novels, he debuted with Ghost Road Blues in 2007, a novel which won the Bram Stoker Award for Best First Novel. Only when you really check out his books you realize just how many genres Jonathan Maberry has touched over the years. From martial arts non-fiction and vampire books, he moved on to horror novels, post-apocalyptic zombie stories, techno-thrillers, teen mysteries, sci-fi stories (think The X Files) and even comic books. He is really a man of many talents, especially considering that he even wrote greeting cards back in the day (betcha you didn’t know this!). Over the years, author Jonathan Maberry had several jobs. He was a bodyguard, bouncer, martial arts instructor, a teacher at Temple University. As a teacher also he wrote textbooks for students. In addition, he created martial arts and self-defense programs for women and the police force. When you think about it, his career could have taken really many different paths, considering that he also knew how to read the tarot and even tea leaves. But then again, the books on the occult and his horror novels do show this facet of his vast knowledge on all that is out there beyond our five senses. One could say the Joe Ledger series is Jonathan Maberry’s most popular series, however, it really depends on which genre is your favorite when you come across this author. I love mysteries and thrillers, so Joe Ledger was my entry point before discovering Rot & Ruin, but I have a Goodreads friend who started with the author’s zombie series and then transitioned to Joe Ledger. For me, Joe Ledger is special. When I started reading this series, I was heavily into military thrillers and horrors, so Joe Ledger fits right in with the rest. It was also at a time when military thriller as a genre was booming. So who is Joe Ledger anyway? Jonathan Maberry created this hardened Baltimore cop who’s seen way too much in his days in a way that we got to love him from the very first book, Patient Zero. Joe is approached by Mr. Church, who wants him to join a super secret special ops government agency to deal with stuff that normal people don’t ever need to learn about. The agency is called DMS and over the next few books, Joe Ledger becomes one of its most important members. Dogs of War, book #7 in the Joe Ledger series, brings back Joe and a newly rebuilt DMS (read Kill Switch to learn what happened to contribute to its total destruction) to try to save the world from total annihilation. There are only a few people left in the DMS and Joe’s Echo Team, so personnel is tight and Joe is almost on his own. When an AI (called Calpurnia) enters the mix, Joe has no idea whether the machine is there to destroy or save the world. Because as sure as hell, Calpurnia’s creator, Zephyr Bain, is dead-set to end it. In Deep Silence, Joe Ledger #10, Jonathan Maberry brings Joe closer to his Rot & Ruin series, with his almost-zombie-like people who become violent and suicidal before major volcanoes. The story is, as usual, hard to put down, and it brings back some of the main characters from the previous in the series. I was not surprised to see the president in the book having a strong resemblance to the current commander-in-chief of the US of A.
I’ve so far read every book in the series that was published – as soon as it was published. If I were to read them now, I would definitely read them in order, starting from Patient Zero. So, yes, I suggest that you read the Joe Ledger series in order because without it you’ll lose much of not only the character progression but also storyline. For example, Dogs of War starts right where Kill Switch left off, and without reading Kill Switch first, the latest Jonathan Maberry book won’t make much sense. Not only that, but some books have recurring (bad) characters, but I won’t spoil it for you. So make sure you that read the Jonathan Maberry Joe Ledger series in the proper reading order, and while you’re at it, read Countdown first. It is a short novella that really helps nail Joe Ledger down and sets the stage for what it is yet to come.